Depending on his findings Dr. Floyd will determine if X-rays are necessary. The first visit at Elite Spine Center will take approximately 1 hour. Upon arrival you will be greeted by our front desk staff and asked to fill out our New Patient Paperwork. Then you will be given a brief office tour which will lead you to one of our exam rooms. One of our assistants will complete a Case History which will give the doctor a better understanding of your health concern. Then Dr. Floyd will review your case history and then perform a series of tests to help narrow down the specific cause of your condition. Depending on his findings Dr. Floyd will determine if X-rays are necessary. 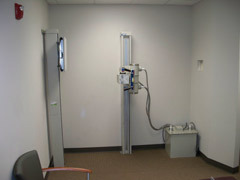 After completing the x-rays you will be escorted back to the front desk to schedule your second appointment. It is important to note that in certain cases Dr. Floyd might elect to start treatment on the initial visit.